We might think the Egyptians were the masters of building tombs, but no other civilization has devoted more time and resources to underground burial structures than the Chinese. For at least five thousand years, from the fourth millennium B.C.E. to the early twentieth century, the Chinese have been building some of the world's most elaborate tombs and furnishing them with exquisite objects. 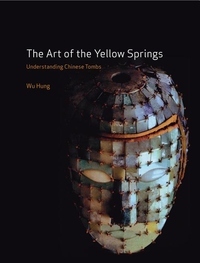 It is these objects and the concept of the tomb as a "treasure-trove" that The Art of the Yellow Springs seeks to critique, drawing on recent scholarship to examine memorial sites the way they were meant to be experienced: not as a mere store of individual works, but as a work of art itself. Wu Hung bolsters some of the new trends in Chinese art history that have been challenging the conventional ways of studying funerary art. Examining the interpretative methods themselves that guide the study of memorials, he argues that in order to understand Chinese tombs, one must not necessarily forget the individual works present in them--as the beautiful color plates here will prove--but consider them along with a host of other art-historical concepts. These include notions of visuality, viewership, space, analysis, function, and context. The result is a ground-breaking new assessment that demonstrates the amazing richness of one of the longest-running traditions in the whole of art history.